She hasn’t always worn a black robe to work. After college (at USF), she wore the uniform of a juvenile probation officer, a college professor (to USF college freshman and then later to budding MCC paralegal students), a newspaper reporter (covering the crime beat and going on police ride-alongs), and an auxillary police officer (Tampa’s first woman ever). She might still be wearing a police officer’s uniform, if it weren’t for her decision to go to law school (at University of Florida) over accepting a spot with the Tampa Police Department. Following graduation, she spent time with Sarasota State Attorney’s Office as its first female legal intern and then for the next 10 years in private practice handling primarily family law and personal injury matters. 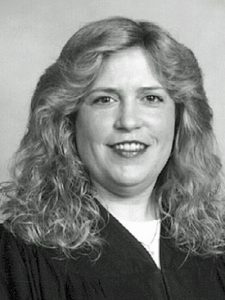 Then in 1988, a mentor convinced her to throw her hat into the race for the recently vacated county court judge position (created when Judge Becky Titus moved to circuit court). She did and she won making the black robe of a county court judge far and away her favorite uniform. Her heart lies in county court. She’s never tired of the work because she loves the constant influx of people — whether a first timer who’s made a mistake, a repeat offender with dangerous record or a defense attorney or prosecutor. The variety and the challenge of fairly balancing the competing interests have been an ideal combination for her. Her love for the work has also always been fueled by life behind the scenes. A year into her judicial career, she and her husband, Gene “Jinx” Burr, welcomed their daughter Alyssa; raising her daughter and spending time with family were labors of love that occupied her time off the bench. With her daughter grown, these days she attributes her continued enthusiasm for her work to the regular, refreshing evenings spent with her husband and three dogs. Though retiring from the bench soon, she won’t be putting her black robes away for good. Inspired by what she sees of her colleagues now retired Judges Lee Hayworth and Andy Owens, she intends to keep donning a black robe, this time as a volunteer, backup county court judge. It’s especially fitting that Sarasota FAWL celebrate and thank Judge Judy Goldman on her upcoming retirement. Among some of her other trailblazing endeavors, she was one of the founding members of our FAWL chapter (in 1984) and at the same time she made her initial run for county court, served as Sarasota FAWL’s third president.